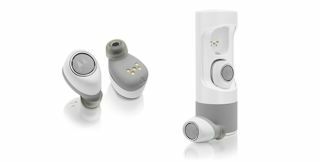 Motorola launches the VerveOnes Music Edition wireless earbuds | What Hi-Fi? Following the Verve Ones+, the Music Editions are splash-proof, can activate Siri and Google Now assistants, and apparently have "HD sound". As the old Bob Dylan song goes, "the times, they are a-changin'." The world of headphones is moving away from its wired origins towards wireless earpods - and, with the release of Apple's Airpods and other alternatives, even wireless over-ear headphones have some competition. Motorola is looking to add another pair of wireless earpods to its repertoire, following the Verve Ones+ with the VerveOne Music Editions - which apparently have a "rich HD sound". The Music Editions have an integrated microphone, so you can talk to Siri or Google Now by holding down the button on the outside of the headphones, and adjustable sound profiles from Motorola's 'Hubble' app. They're also splash-proof (rated at IPX4), so they should survive if you wear them running and get caught in the rain. Motorola says the headphones have an eight hour battery life - but we get the feeling that's more likely to be the total battery life of the charging case, with the actual battery life of the headphones being approximately three hours or so. We've contacted Motorola for clarification, and will let you know as soon as we have more news. The Music Editions are priced at £150 and are available now from Motorola's site. Other retailers can expect to get them later in February.